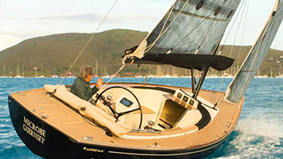 As a leading Jeanneau dealer in New England, Bluenose Yachts has sold nearly every Saffier Yachts model available for sale in the past seven years. We offer uncompromising service both before and after the purchase of your new Saffier. Owners frequently store their Saffier Yachts with us for the winter since we care for and maintain their Saffier better than anyone on the East Coast. We offer a wonderful charter program that assists to pay for your annual ownership costs and keeps your new Saffier in ready to go condition when your busy schedule allows you to enjoy your boat in a the way it is intended, hop on and GO sailing. We also offer a unique extended warranty program. Whether you want a new Saffier, a brokerage Saffier or to sell your Saffier, Bluenose Yacht Sales offers a quality difference that you should experience. A shipyard like Saffier Maritiem does not just happen out of the blue. For its origins we have to go back to the mid fifties. With the help of his father, Richard Hennevanger bought his first boat, the Rainbow, at the age of twelve. In fact, it could barely be called a boat, because the Rainbow looked more or less like a pile of wreckage. Nonetheless, Richard and his father believed in this boat and after a lot of blood, sweat, and tears they turned it into a beautiful boat, truly a rainbow! the IJmuiden estuary one day, they were spotted by a coaster. The captain of the coaster fell in love with the Rainbow and bought the boat on the spot. The Rainbow was hoisted aboard; father and son were paid and brought ashore. Richard had caught the sailing virus and would never be cured. After his service in 1961, he decided to move to Australia with his wife. Soon after, Richard Hennevanger started his own shipyard. In 1972 the family sold everything they owned in Australia and decided to build yachts in the Netherlands. Richard and his wife moved to their homeland with their sons Dennis and Dean, who were born in Sydney, and were at that stage 7 and 4 years old. By that time Dennis and Dean were both good sailors and Dennis had already competed in his first junior sailing competition in the bay of Sydney. The yacht, a 16 meter ketch named the Spirit of Sydney, was built in the record time of one year. During the following eight years the family Hennevanger sailed around the world on the Spirit of Sydney. Dennis and Dean came into contact with many different cultures, developing an extensive general knowledge. Mother Hennevanger taught them reading and writing. Meanwhile, Dennis and Dean playfully learnt all aspects of sailing on the Spirit of Sydney. In 1980 the family decided to sell the Spirit of Sydney and to return to Holland. By that time, both boys could sail, moor and navigate the boat blindfolded. Back in Holland, Richard started a new shipyard. Dennis was being trained as a mate while Dean studied naval engineering. Dennis also completely immersed himself in a new water sport: windsurfing. Between 1980 and 1985 he won the Dutch Championship three times and the European Surfing Championship twice. It was an excellent way of showcasing his talent. After Dean had finished his training, he started working for his father and immediately began to build his first boat. The 9 meter-long catamaran named “Hotlegs” Dee was sailing the waters of the IJsselmeer one year later where Dean scared the living daylights out of many a sailor by screaming past at over 20 knots! When his surfing madness had abated, Dennis, who still had not had enough of travelling, worked as captain on various large yachts on the Mediterranean sea. In 1999 Dennis showed a water sports journalist what the Saffier 6.50 was really capable of. With a south-westerly force 7 wind they crossed over from IJmuiden to Lowestoft, a distance of 110 miles. The Saffier reached the other shore without any problem, thus proving her seaworthiness. In 2001 the two brothers decided it was time for a follow-up. Naturally father had to create the new design. A year later the Saffier 8.00 became a reality. The Hennevanger experience can be recognized in this vessel as well. The media also noticed that and in 2003 the Saffier 8.00 was nominated as Boat of the Year. With only a difference of 1 point from the winner (max fun35) she was placed second. 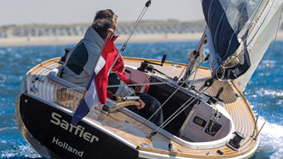 Soon afterwards the Saffier 8.00 was nominated as European Boat of the Year 2004. Unfortunately the Hennevangers had to pass up this opportunity due to numerous orders and they clearly chose to put their customers first. At the end of 2004 they nonetheless started yet another new design: the Saffier 32 ft. Boats were already being bought from the drawings and building could commence forthwith. In the meantime the 100th Saffier 6.50 left the shipyard in 2005. The Saffier was slowly gaining international recognition and the first Saffiers were being delivered all over Europe. Saffiers were also sold in America and the Caribbean for the first time. While the building of Saffiers escalated, the shipyard, that in the meantime had been named Saffier Maritiem, remained loyal to one business aspect. The yard continued to work for KNRM, the pilotage- and professional shipping in general, and with that strengthened their financial position while limiting their risks. In December 2005 the first Saffier 32 was launched, followed by a trial voyage period of six weeks. Only then would the Hennevangers be a hundred percent satisfied. In the Fall of 2007 a new design is ready, the Saffier Se 26 open daysailer, this time designed by all three of the Hennevangers. This Yacht will proof to be a turning point for the Saffieryachts brand; From day one the Se 26 attracts huge media attention resulting in winning the highly prestige European of the Year Yacht contest 2009. The revolutionary design, which enable any one to sail comfortable all by itself attracts from the very first drawings customers who realize the potential of this daysailer. Effortlessly sailing is the key for lots of people and the se 26 provides all of this and together with her stunning looks and performance she is a total hit. For the yard this means a substantial growth. Internationally they get more and more foot on the ground and the 2 brothers manage to keep to their first ever promise; build their Saffiers the best way they can. 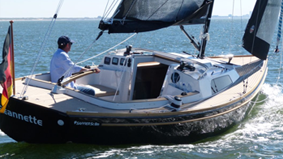 2010 There is a new design, this time totally designed by Dean Hennevanger, The Se 23 daysailer. Dennis does all they extensive tested on their homewaters in rough Northsea and give signal green to show her for the first time on the famous Dusseldorf boatshow. 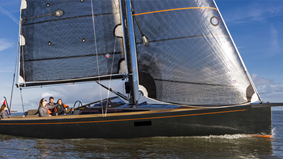 An absolute eye catcher the Se 23 wins again the European yacht of the year contest 2011 and the Dutch award Hiswa Yacht of the year 2011. Never before has a Dutch yard received 2 times a European yacht of the year award and sales continue to rise. Expanding their market the brothers surge for trustworthy reliable partners who know there waters and customers in other countries. This result in a fine network where every customers can talk in his own words and culture to his Saffier representive in his or her country. The Sc 10m is the next design of Dean Hennevanger and again straight from the drawings 6 are sold. The timeless classic lines with all the modern qualities of the deck and cockpit layout are the ultimate for anybody who truly loves sailing. In 2013 the brothers come out with the new Saffier Sc 8m Cabin. Combining the daysailer approach of easy sailing alone and feeling of being one with nature, together with room inside with much more comfort proofs to be what the customer is searching for. Just in 1 year time 32 are sold and delivered to their owners who sail here anywhere from Japan, Usa, Caribean and Europe. In 2014 The Saffier Se 33 Ultimate daysailer is launched, a model which combines effortless sailing with speeds over 17 knots! 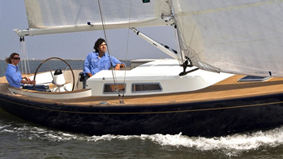 A whole new market is found where people want a stunning, good looking and fast sailing boat. The Saffier Se 33 UD is nominated for the European yacht of the year contest and for the Hiswa yacht of the year contest. 16 models are sold in 1 year time. Both brothers are active in sailing to this day. Dean likes to sail with his family in a Saffier 8.00 cabin. 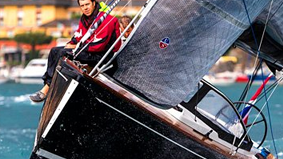 Dennis is often to be found in sailing competitions with the yard build ,, Saffier Nitro”. By remaining actively involved they are on the alert for new developments that may possibly be adapted for the Saffiers. In this way every Saffier is a modern yacht to which the latest innovations have been applied.